The Vermont House of Representatives is the lower house of the Vermont General Assembly, the state legislature of the U.S. state of Vermont. The House comprises 150 members, with each member representing around 4,100 citizens. Representatives are elected to a two-year term without term limits. Vermont had a unicameral legislature until 1836. It added a senate by constitutional amendment. The House meets in Representatives Hall at the Vermont State House in Montpelier. The Speaker of the House presides over the House of Representatives. The Speaker is elected by the full House by Australian Ballot. If there is only one candidate, the election is usually held by voice vote. In addition to presiding over the body, the Speaker controls committee assignments and the flow of legislation. Other House leaders, such as the majority and minority leaders and whips, are elected by their respective party caucuses relative to their party's strength in the chamber. 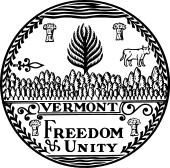 There are three party caucuses in the Vermont House; the Democratic Caucus which is currently in the majority, and the Republican and Progressive Caucuses, each currently being in the minority. Independent members of the House may choose to caucus with a party or none at all. As of 2018, the Speaker was Democrat Mitzi Johnson of the Grand Isle-Chittenden District. The Majority Leader was Democrat Jill Krowinski of the Chittenden-6-3 District. The Republican Minority Leader was Republican Donald H. Turner of the Chittenden-9 District. The Progressive Minority Leader was Progressive Robin Chesnut-Tangerman of the Rutland-Bennington district. As of 2018, the Clerk of the House was William M. MaGill. The house typically meets Tuesday through Friday during the session. "Home | Vermont General Assembly | Vermont Legislature". legislature.vermont.gov. Retrieved 2018-04-07. "Clerk of the House | Vermont General Assembly | Vermont Legislature". legislature.vermont.gov. Retrieved 2018-04-07. Remsen, Nancy & Hallenbeck, Teri (January 8, 2009). Following the Legislature. Burlington Free Press.